Stormtroopers, though evil most of the time (depending on which side you are on), are one of the most recognizable figures from the Star Wars movie series – though not quite as universal as Darth Vader himself. Regardless of if you fight for the resistance, you have to admit that Stormtroopers have a pretty cool-looking uniform and helmet! When the Death Star blew up in Return of the Jedi did you shed a few tears thinking that there would never be a chance to join the Galactic Empire as a Stormtrooper? Well, don't worry! They're back with a new fancy name in The Force Awakens. They're called the First Order and you can wear this Adult Deluxe Star Wars Ep. 7 Stormtrooper Costume, which is a new and upgraded version of the classic armor from the original trilogy. You don't have to be sad anymore! Now get out there and blast some Ewoks in this officially licensed costume. 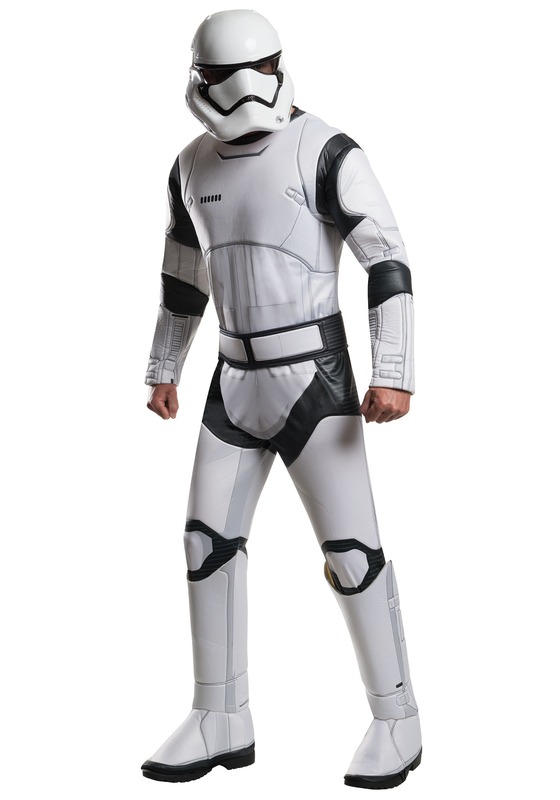 This Stormtrooper costume comes with a foam padded jumpsuit with a Velcro closure in the back as the starting base of the costume. The jumpsuit also has attached foam boot tops with elastic under foot for a secure fit. The included foam belt adds a touch of detail to the jumpsuit. And no self-respecting Stormtrooper would go out without his mask, so this costume comes with a two-piece plastic mask that has Velcro closures at the top. Add a blaster for a costume that is straight out of the seventh episode of your favorite film series!